Environmental enthusiasts pursuing a career in teaching can benefit from scholarships for outdoor education majors. 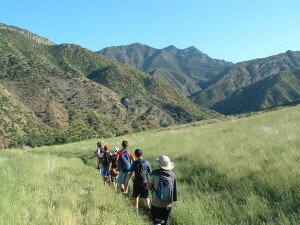 Outdoor education is an ideal pathway for anyone wishing to avoid the typical desk job and spend their days in nature. Those majoring in outdoor education will be given the diverse ecological knowledge and skills to teach people about the outdoors. Outdoor educators can organize K-12 school programs, act as park tour guides, teach wilderness survival, lead rock climbing courses, and more. Whether working with children, teens, or adults, outdoor educators have the valuable opportunity to inspire a love of Mother Earth in others. According to the BLS, the overall employment of recreation workers, including outdoor educators, will grow by 14 percent through 2022. Turn your outdoor adventures into an in-demand career with one or more of these outdoor education scholarships. Through the Association of Outdoor Recreation and Education (AORE), the Bridge Builder Scholarship is awarded annually to currently enrolled undergraduate or graduate students who have excelled in creating inclusive outdoor education communities for ethnic minorities, women, and/or persons with disabilities. Applicants must be at least 18 years old, be pursuing a career in outdoor education, and be involved in an ongoing initiative to increase inclusion. Recipients will be granted funding for the AORE National Conference that November. Sponsored by Osprey, the Bill March Student Achievement Award is awarded by the Association of Outdoor Recreation and Education (AORE) to provide $2,000 to undergraduate or graduate students who have made outstanding contributions to an outdoor education program. This award memorializes a renowned mountaineer from the University of Calgary who successfully lead the 1982 Canadian Mount Everest Expedition. Nominees must currently be AORE student members with good standing. Ranging from $1,000 to $5,000 apiece, the Bodie McDowell Scholarship Program is hosted annually by the Outdoor Writers Association of America (OWAA) to give three or more awards to undergraduate and graduate students actively pursuing a degree related to outdoor education or communications. Qualified candidates must have at least junior-level standing at an accredited post-secondary U.S. institution. Preference is given to students seeking to educate others about the environment via print, film, art, or broadcasting. At the University of Wisconsin- Stevens Point, the BOW Inc. Outdoor Skills Scholarship is awarded for $500 each year to an undergraduate male or female student who has been involved in teaching traditional hunting and fishing skills to others. Eligible applicants must be pursuing the outdoor education major, carry a minimum cumulative GPA of 3.0, have good standing in the College of Natural Resources, and be actively involved in student clubs. In the amount of $500, the Buckeye Trail Academic Scholarship is bestowed by the Buckeye Trail Association (BTA) each year for graduating high school seniors or current undergraduate students who are studying forestry, outdoor education, conservation, environmental science, or natural resource management. Qualified applicants must be admitted to an accredited program at least two years in length, be BTA members, have a minimum cumulative GPA of 2.0, and exhibit a love for the outdoors. Each year, Central Wyoming College (CWC) provides five Outdoor Education Scholarships for $1,000 for incoming freshmen who will be pursuing the Outdoor Education and Leadership (A.A.) or Outdoor Recreation (A.A.S.) program full-time. For consideration, candidates must pass a faculty interview, maintain a minimum cumulative GPA of 2.5, submit official transcripts, and be sincerely committed to a career as an outdoor educator. Preference will be given to female students meeting this criteria. Since 2005, the Outdoor Amusement Business Association (OABA) has granted the David Smith Memorial Education Scholarship for $3,000 each year for students who are interested in furthering their goals within the outdoor education industry. Accepted applications will come from OABA members enrolled at an accredited college or trade school with a minimum overall GPA of 2.5. Attaching an official transcript, two letters of recommendation, professional photo, and brief one-page autobiography is required. At Western Colorado State University, four Eastman Awards in Recreation and Outdoor Education are available each year for new freshmen, juniors, seniors, or transfer students who exhibit outstanding achievement potential in the outdoor education field. Successful applicants must have a minimum overall GPA of 3.0, score at least 21 on the ACT or 990 on the SAT, uphold the values of the recreation profession, be actively involved in community service, and exhibit special recreational talents. Administered by the Southern Sportsmen Foundation (SSF), the Hoye Horn Memorial Scholarship is awarded for up to $1,000 each year to Little River County residents of Arkansas who are pursuing an accredited college degree in forestry, biology, zoology, outdoor education, or other environmental sciences. Applications must be returned with a resume of extra-curricular activities, list of professional goals, and one-page personal essay. Scholarships are renewable by those maintaining a ‘C’ average. The Windstar Foundation operates the John Denver Scholarship Fund to distribute one $1,000 and two $5,000 awards annually for qualified undergraduate and graduate students who are attending an accredited U.S. college to study environmental science, outdoor recreation, outdoor education, environmental engineering, or a related major. Qualified candidates must hold a minimum college GPA of 3.0, have at least junior standing, and write a 500-word essay describing an environmental issue they’re working to resolve. Every semester, the Joseph Neale Memorial Scholarship is awarded for $1,000 to students at Alaska Pacific University who are currently majoring in the Outdoor & Environmental Education program and pursuing the Teaching Certificate. Eligible students must be at least sophomores, exhibit financial need, show active involvement in the campus community, and demonstrate social responsibility. Other APU undergraduate outdoor education scholarships are the Leah J. Peterson Scholarship and Flint Hills Scholarship. The Julian W. Smith Memorial Scholarship was created by the Michigan State University College of Education to honor the former Director of the Outdoor Education Project who touched the lives of countless youth for over 20 years. Eligible undergraduate candidates must be preparing to teach in outdoor or science education, carry a minimum overall GPA of 3.0, have completed at least 56 credits, provide one recommendation letter, and share Smith’s love for God-given natural resources. Founded in 1989 by the Wilderness Education Association (WEA), the Kitty Drury Memorial Scholarship will provide up to $1,000 for aspiring outdoor leaders who are pursuing a college degree or professional development training in outdoor education. Eligible recipients must be enrolled full-time at a WEA-accredited institution, possess a minimum GPA of 3.0, and have financial need for any Outdoor Education Certification courses. Consideration is also given to those earning Wilderness First Responder Certification. Through the Grand Haven Area Community Foundation (GHACF), the Larson-Veneklasen Outdoor Education Scholarship is presented annually to graduating high school seniors who are pursuing outdoor educational experiences at a licensed facility. Applicants should have a minimum GPA of 2.5, wish to build a career in outdoor education, show financial need, and have resided in Michigan’s Tri-Cities region for at least five years. Preference is given to courses from the National Outdoor Leadership School. SUNY Cortland’s Department of Recreation, Parks and Leisure Studies (RPLS) gives the Marcia K. Carlson Scholarship Award each year to memorialize her over 15 years of service at the Outdoor Education Center on Raquette Lake. To qualify, students must be seniors, have maintained a minimum GPA of 2.5, be majoring in outdoor education, demonstrate a dedication to fostering high regard for the natural world, attach a resume, and provide four essay responses. Undergraduates could also receive the Joyce A. Gaus Scholarship. In honor of his leadership during the early 1980s, the Mert Bishop Memorial Scholarship is bestowed annually for $1,000 through the Texas Outdoor Education Association (TOEA). Eligible candidates must be in-state Texas residents, be at least 18 years or older, have a declared major in outdoor education, attend an accredited U.S. college, and show experience promoting outdoor recreation activities. Recipients will be invited to attend that year’s TOEA Annual Workshop and write an article for the Newsletter. Sponsored by the Public Education Foundation (PEF), the Officer David VanBuskirk Memorial Scholarship is available for $1,000 annually to graduating high school seniors who are enrolling at an accredited college to major in law enforcement, emergency medical services, outdoor education, or recreation management. Applicants must be active in outdoor experiences, such as rafting, hiking, mountain climbing, or kayaking. Submitting a 350-word essay, two letters of recommendation, and a professional resume. Valued at $1,000, the Pauline Winter Professional Scholarship is gifted by Oklahoma State University to full-time undergraduate students enrolled in the College of Education who are majoring in recreation management, therapeutic recreation, or outdoor education. Qualified recipients must be at least sophomores, carry a minimum cumulative GPA of 2.0, show involvement in the field’s professional clubs, and articulate clear goals in outdoor recreation. Also provided by the Wilderness Education Association (WEA), the Pete Petersen Memorial Scholarship was created in memory of an outfitter at Paul Petzoldt Lodge in Driggs, Idaho, whose strong personality influenced hundreds of students taking WEA courses. This award will be granted to undergraduate or graduate students who are advancing their careers with Outdoor Education Certification. Attending a WEA-accredited institution with a cumulative GPA of 3.0 or higher is required. Offering several undergraduate outdoor education scholarships, the Sara Shallenberger Brown Scholarship Program is operated by the Garden Club of America (GCA) and Student Conservation Association (SCA) each year. Eligible applicants must be aged 19 to 20, attend an accredited U.S. university, be majoring in outdoor education, be devoted to environmental conservation, and have prior SCA experience. Recipients will be given $250 per week while working on a summer trail crew in a national park. Annually, the Safari Club International (SCI) awards the Education Sables Scholarship for up to $4,800 to young women who are studying wildlife ecology, natural resource management, conservation education, or other outdoor education majors. Candidates must be enrolled full-time at a partnering school: Texas A&M University, West Virginia University, University of Idaho, Unity College, or University of Montana. Applications must include three recommendation letters, a current resume, proof of academic ability, and a 500-word essay on conservation. Lauded as one of the most lucrative graduate outdoor education scholarships, the Switzer Environmental Fellowships are granted by the Robert & Patricia Swtizer Foundation annually for $15,000 to master’s or Ph.D. students in New England and California whose career is focused on environmental improvement. Qualified students must be enrolled full-time, have U.S. citizenship, attend an accredited school, have strong academic standing, and have at least one semester remaining. All fellows must attend a two weekend-long retreat. In the amount of $4,000, the Vern and Elaine Clark “Champion” Scholarship is awarded through the Foundation for Outdoor Advertising Research and Education (FOARE) each year for undergraduate or graduate students pursuing an accredited program connected to the outdoor advertising industry. Along with an application, candidates must submit two written letters of recommendation, a resume of work and community service, official college transcripts, and a one-page personal statement of objectives. Administered by the Emporia Community Foundation (ECF), the What’s in Outdoors Scholarship Fund will provide $1,000 awards annually for graduating high school seniors or current college students who are majoring in wildlife management, outdoor education, environmental science, or any other nature-based curriculum. Eligible candidates must live in Kansas, attend an accredited in-state university, and show a commitment to getting youth or families involved in conserving natural resources. At Northern Arizona University, the Yoder Outdoor Leader Scholarship was founded in honor of Dustin and Kristen Yoder, two siblings who tragically died in a mountain climbing accident in the Cordillera Blanca Mountains of Peru. To qualify for the $1,000 scholarship, candidates must be enrolled in outdoor education coursework, have at least full-time junior status with 60 or more credits, show clear interest in outdoor leadership, and carry a minimum GPA of 3.0. Unofficial transcripts, resumes, recommendation letters, and essays will be reviewed. Paying college tuition today can feel like climbing the world’s tallest mountain. However, scholarships are abundant for students who know where to look. Like grants, scholarships are free gift aid that doesn’t need to be repaid after you graduate. Applying for scholarships is one of the best ways to boost your finances in preparation for becoming an outdoor educator. These great scholarships for outdoor education majors range from $500 to $8,000 to help students with a passion for teaching others about the great outdoors.